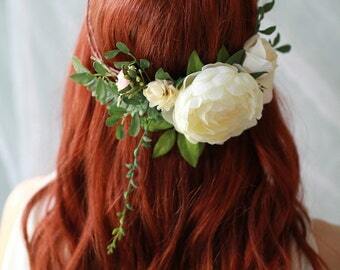 Beautiful dainty crown fit for and elf queen. 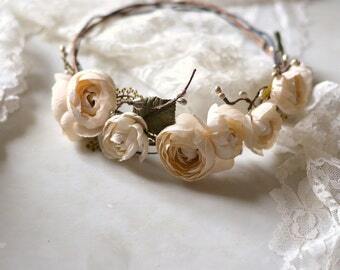 From the picture I thought the headband portion would be white but it and the chain are actually bright silver and the leaves are a really pretty pearly finish that catch the light. 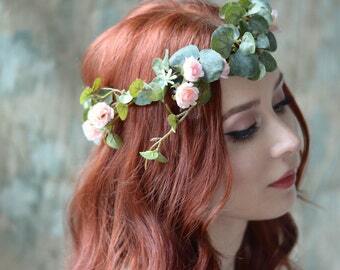 These crowns were perfect for an enchanted forest themed shoot we did for our event rentals! The girls loved them. Great quality and fit! Please select your order carefully, I do my best to represent the color and style of my designs in the photos and descriptions. But please reach out to me if you have any questions or would like more photos to help make your decision! Due to the made to order nature of my designs and small supply, I do not accept returns. If you would like to make an exchange I am happy to help! Contact me within 3 days of receiving your order and select something of a similar price point that you would like to exchange your order for. All exchanges must be received by me in unused condition with their tags still attached and in their original packaging within 7 days. Return shipping and shipping of the exchange item are the responsibility of the buyer. Customized designs are not eligible for exchange. I cannot be held accountable for any losses that occur during shipping. If you are interested in requesting adding insurance to the shipping of your order please contact me before placing your order! Delivery time varies based on the shipping method you choose during checkout. I have no control over any customs fees or import taxes charged in your country and it is the buyer's responsibility to pay them. Please be mindful of this when making your purchase. I spend a great deal of time crafting each item to be as secure and long lasting as possible, so if you treat your adornments delicately they can last for generations and even become heirlooms! 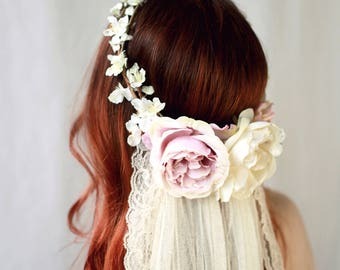 Store them with care as some fabric florals can fade if left for long periods of time in direct sunlight and be sure to hang your veil someplace safe to avoid creasing or snags. 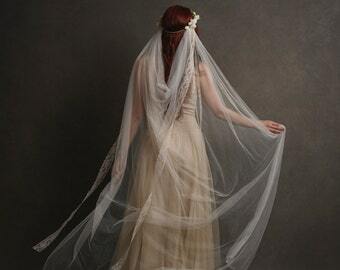 I would recommend using a garment bag to protect your veil. If you are interested in placing a wholesale order please contact me for information on pricing, availability, and production time. Please reach out to me before making your purchase if you need an item in a hurry! If I have the time in my schedule to rush production of your order I am happy to do so. My standard production time is typically 1-2 weeks. 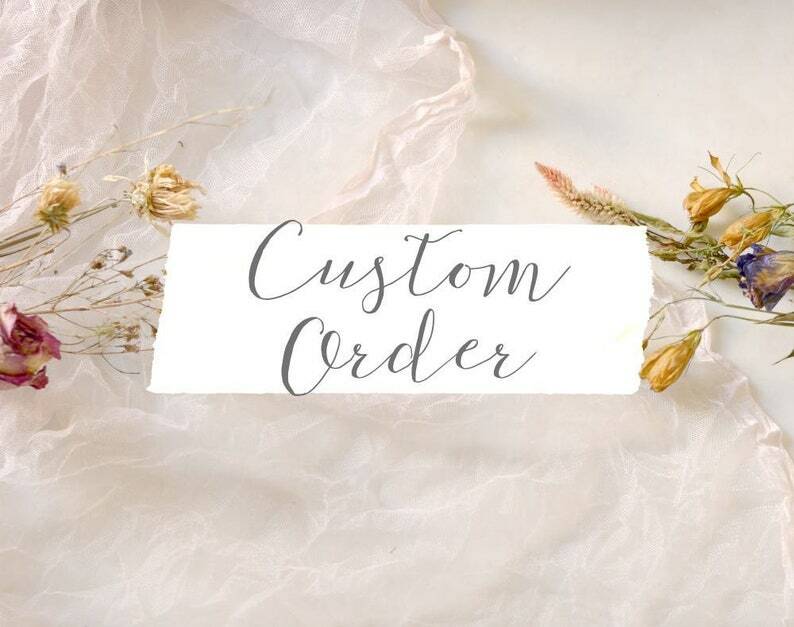 If you need an item made and shipped out sooner than that, there is a $15 fee for all crowns, headpieces, and veils. Priority or Express shipping will be required.